Alex is a relatively new GM, receiving the title about 4 years ago. He is always a dangerous opponent in action events, as he tends to move relatively quickly and rarely gets into time trouble. He is good friends with Novikov, as they were born in the same area in Ukraine. He seems to be a player who thrives on the initiative, as when he is defending he often can have some troubles. 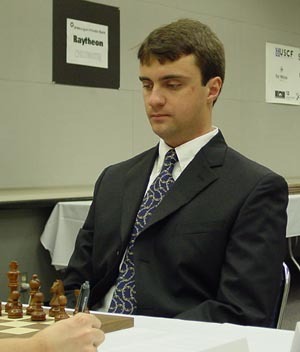 Despite all this Stripunsky is a very dangerous opponent, and is trying to become not just a Grandmaster but a strong Grandmaster. His results are not as consistant as other GM regulars Novikov and Yudasin, yet he tried his best to change this when he came in first or tied for first in 5 consecutive NY Master events! These days he has been playing mainly Taimanov type systems against e4, and the Semi Slav against d4. He is ranked 10th in the USA as of August 2004.